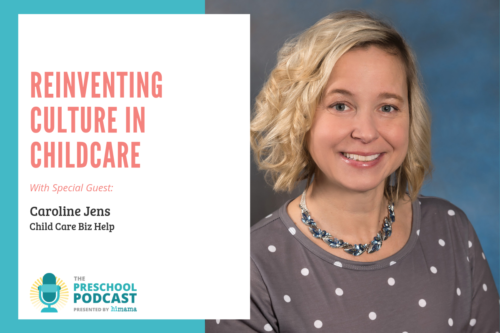 Episode #143 – Building real parent-teacher relationships is so important at a child care center. 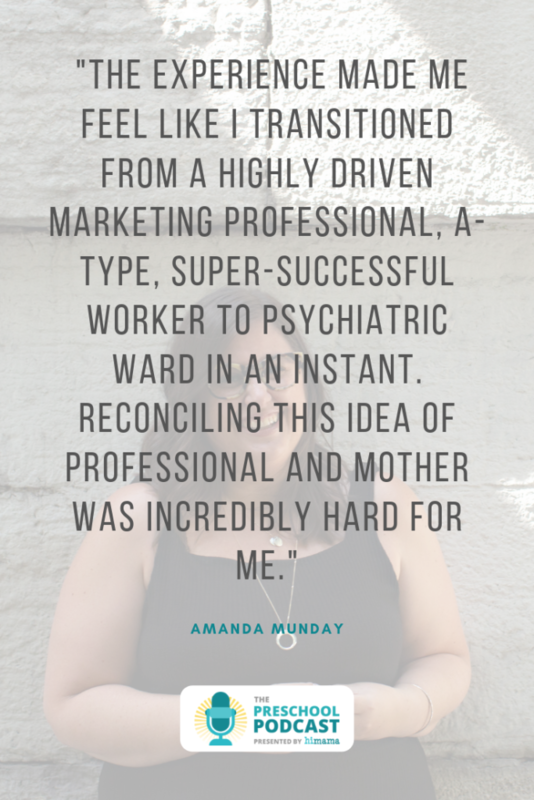 In this episode, we get personal with Amanda Munday, owner of The Workaround, a coworking space in Toronto that supports working parents and author of Day Nine: A Postpartum Depression Memoir. 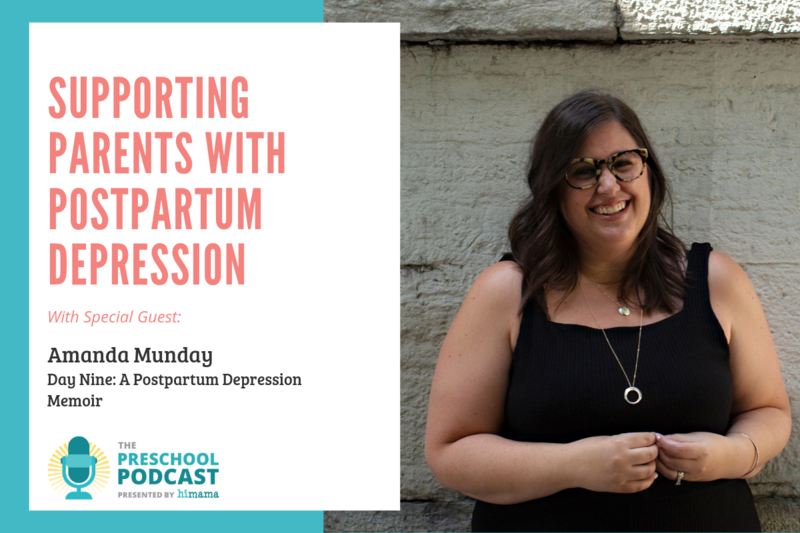 We talk about her journey into motherhood as well as her experience with postpartum depression. 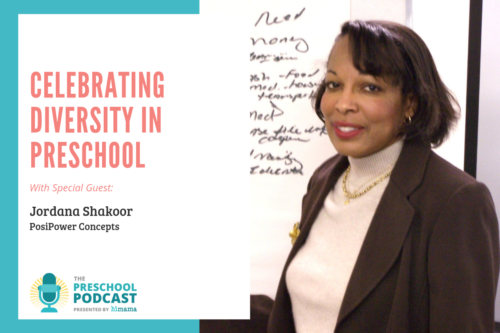 She also shares how she challenges her team of educators to be curious and get to know their families on a personal level. Where the writing really dived deeply into the experience of parenthood and transitioning into childcare and what it’s like for a family after they have the baby. 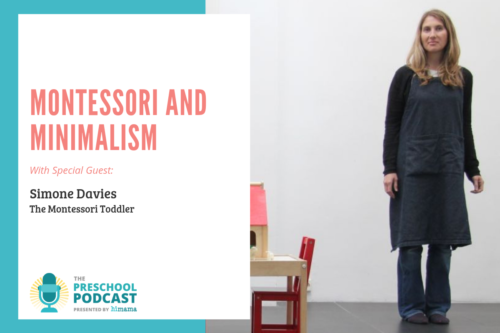 Amanda, welcome to the Preschool Podcast! Oh, hey, Ron! Thanks for having me. It is our delight to have Amanda on the show today because Amanda Munday was part of the HiMama team. And she’s since gone on to a couple of small things, including founding her own business. She’s the founder and CEO of the Workaround, which we’re going to ask her a little bit about. And she’s also the author of an upcoming book called Day Nine [A Postpartum Depression Memoir], which we’re going to talk about as well. So wonderful to have you on the show, Amanda. Thanks Ron. It’s like being back with the family. It’s so fun! It’s kind of strange, doing a Podcast episode with you. But it’s fun, too! Yeah, it’s fun, you know? It’s good to be back. So let’s start off learning a bit about this business you’ve started, the Workaround. Obviously a cool connection with a lot of the things you learned and experienced about childcare and early-childhood education, both at HiMama and [in] your personal experience. Tell us a little bit more about it. Yeah, so I have two kids. They’re four and two [years old] – Fiona is four and Everett is two. And I’m a working parent and tech in Toronto, here. And so I’ve done two transitions back from maternity leave. In Canada maternity leave is twelve months, now up to 18 months. So it’s pretty long time. So unlike in the U.S. where there is no mat [maternity] leave and women – mothers and parents – often struggle with just trying to manage a newborn baby. In Canada what we struggle with is stepping out of the workforce for a year and then trying to reintegrate. And so I did that. I came back to HiMama with my second child and really got pretty angry about the cost and the situation of childcare in this country. Childcare in Toronto for an infant runs $2200 to $2400 per month for high-quality, licensed center care. And if you’re entrepreneur, if you want to work part time, if you want hourly childcare in any way there’s basically no option for you. And so what that means is, if you’re part of a heterosexual household and you’re a woman you’re likely making 70 cents on a man’s dollars. So if someone’s going to step out of the workforce because of the cost of childcare, it’s probably the mother, the woman, which means suddenly we have a whole bunch of things happening. We have… it’s really hard to come back to work after a year, especially when you work in tech. It’s basically a new company as soon as you go back. Everything is new. And women leave the workforce all because childcare is so expensive. And I just found it to be incredibly stressful and really… I figured there had to be a better way, and there had to be a way for parents to be able to work and thrive in their careers while still being around and supporting their children. And it just doesn’t… there isn’t a model that exists for that. So the Workaround came about, really, as a need for me. I just wanted a space, a co-working space, an office where you could work and bring your kid if you have to. Now of course we know that if you bring your kids along to work, you’re not getting any work done. So what we have is high-quality, play-based learning, early-childhood educators who run the childcare program that is separate from the working area. So we’ve got a co-working area – 55 seats – and then we’ve got a full classroom where our registered early-childhood educators are carrying out a drop-in, hourly-based program for our entrepreneurs who can come, get a cup of coffee, focus on their work for a few hours and they know that their children are cared for in a high-quality environment. It’s such a kind of obvious idea when you explain it. It’s one of those things, it’s like, why didn’t this exist before? And I’m sure any parent – including myself – who’s tried to do work like you explain while your kids are around, it’s so unproductive and so hard. And also you want you want to play with them, and if they’re right there beside you and there’s not someone there like an educator to do the play-based learning with them, it’s a constant, constant challenge. So certainly solving a problem. Thank you, yeah. I mean, we’re one of only five in North America. And so when I went looking for models of this, I’m calling everybody and saying, “Okay, who’s got childcare and co-working in the same space?” And we know that the licenses vary by state, and they vary by province here in Canada. So a lot of people are concerned about, “Well, how are you doing this with licensing?” We follow the ratios as per the Ontario government. We’re following two-to-one for infants and three-to-one for over 2 [years old]. And we still make it work – at least we have families who come in. On Sundays we have 22 children who come into our space because they come in for a couple hours, they take the spots and somebody else grabs the spot in the afternoon and takes it. So we can still serve 20, sometimes even – depending on evenings and events – we can serve 30 families in a day in the east end, who need part-time, occasional care. And so for him, he really appreciates that he can go down during naptime. He can go down, he does lunch and he feeds his daughter, and then he goes and gets his meetings done in our conference room. And he feels like he’s kind of, quote, “doing it all”, which I think then challenges this idea of, “Who is the primary caregiver? Who has to stay home?” It makes me really happy when I see dads in our space for that reason. Yeah, and you mentioned part-time, occasional care. And I imagine part of the shift in the trend that the Workaround caters to is people don’t have 9-to-5 jobs and careers in 2019 like they did 20 years ago, right? I know people are looking for flexibility, and I think also companies understand that flexibility is important and so are offering that to their employees, too. That’s right, the gig economy is a real factor, right? And it touches on things like commute times. In the East End [of Toronto] – especially where we are at the Workaround – on a bad transit day it can take an hour to get to downtown. And so there and back, that’s two hours you could spend with your family. So if you can negotiate with your even corporate employer to do one or two days a week from home, but knowing you’re not going to get anything done at home, if you spend it at the Workaround now suddenly you have an opportunity to spend more time with your kids but still being fully committed to your employer. And it connects with my other work. One of the things that has really become a passion project for me lately is this idea that parents are not less efficient. In fact, we’re more productive and more efficient than a lot of workers because we don’t have glut, right? We don’t have the time to surf Facebook or read an article before we jump into our work or spend 15 minutes chatting with our friends in the hallway. We have to do our work, so when we’re on site we’re completely focused. I find parents are incredibly productive with the time they’re given because they have to be. As know, if you’ve got daycare pick up at 5:00 you’ve got to go. You’re leaving; it’s a hard stop. You can’t sort of take a longer workday and then stay late until 8p.m. to get what you needed to get done. So I find there’s a common misconception that parents focus a split between their family life and their home life, and the family life and the workplace. But in fact I find – especially at the Workaround – most of the time parents are there for four hours. And so that’s a half-day. We used to work n a co-working space in Toronto and most people would be there [from] eight to ten hours. But in fact most of the people at the Workaround are only there [for] four. And why is that? Because it’s all the time they have to focus on their jobs and then they got to get back to the other stuff. Yeah, certainly I have experienced that productivity out of necessity. Yes, yes! Like, if I have a two hours, you better believe I’m doing all of the mission-critical, most important work that I can because I don’t have time to sort of work on the projects I feel like working on. I’ve got to work on these most-critical, most-important things. And if I am lucky enough to get some more time I’ll tackle this other stuff. 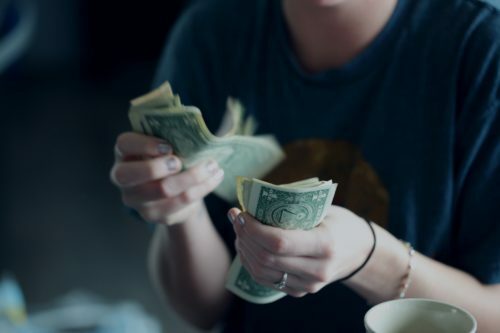 And really that comes about from this mindset shift that parents have where the ones who love their jobs, that are happy in their work and want to thrive, have to figure out a way to balance their careers with their families. And that like really saying present and being productive in the time you have, regardless of whether you’re in home life or you’re in work mode. Yeah, exactly. Very cool project. And great to see the success with the Workaround here in Toronto. I know I was there for the grand opening a lot of other HiMama folks, it’s really cool. So switching gears, you’re also the author of a book that’s coming out soon called Day Nine. And it is a memoir of your own personal experiences. And it covers some tough topics, and we want to talk about those. Can you give us a summary about what this book is all about and what drove you to write the book? Yeah, absolutely. 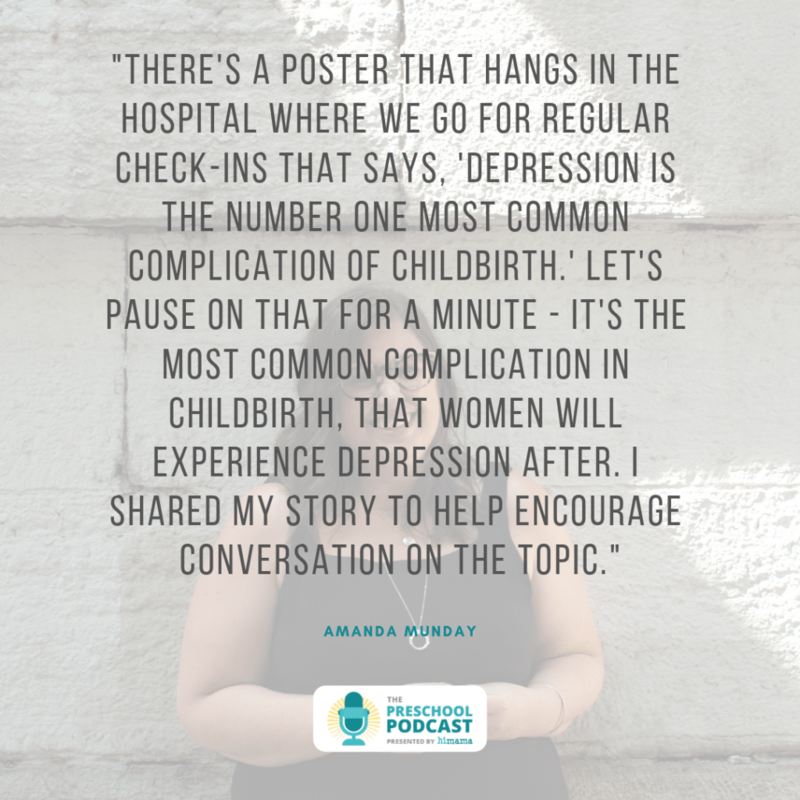 And it’s the reason I reached out to say, like, “Hey, let’s talk about this on the Podcast,” partly because it is really common to experience postpartum depression. And I’ll give you the journey of how I got from postpartum depression to HiMama to the Workaround. And in fact I sort of feel like they’re all connected in a lot of ways. So as I mentioned have two kids, they’re four and two [years old]. When my daughter – who’s now four – was nine days old I was committed involuntarily to a psychiatric ward here in Toronto for postpartum depression. And that came about after nine pretty intense days. So when she was born, she was born vaginal breech, which is very unusual. So it wasn’t a planned C-section, as we expected. It ended up being a bit of a medical birth experience when she was born on the O.R. [operating room] table with eight or nine doctors [who] started considering this to be, like, a medical event with a capital M.
And then for a lot of cases, for a lot of parents, eventually you fall asleep and you let go of that worry. But for me I wasn’t able to do that. I continued to worry about her. I didn’t have an appetite. I was crying all the time over some really silly things. Like, the wrong size diapers sent me into a huge emotional turmoil. Even when my husband Steve took the baby away, my mother came by. They gave me some time alone. I still couldn’t sleep because I was consumed with these thoughts that the baby was in danger, and that if she was in danger that meant that I was in danger. And then instead what they did was form me, which is in Toronto normally a 72-hour hold-and-release policy where you’re on observation for a few days. But in my case I stayed 18 days. So that was that was really hard. It was really hard for our family to spend the first three weeks of my daughter’s life in a psychiatric ward. When I went to the psych ward I really believed there’d be other moms and babies that were there, but there weren’t. It was a regular psych ward like any other. It was coed, 15-minute bed check, no lights in your room, door that don’t lock, all of it. And it really put a lot of pressure on our family. And then for me personally it really called into question this idea of transitioning from a marketing professional, A-type, highly driven, super-successful worker who had been on a conference call – like, I was on a webinar at noon. My daughter was born at 9:00p.m. that day. I went from super-driven professional to psychiatric ward in what felt like an instant. And reconciling this idea of professional and mother was incredibly hard for me. And so eventually I got released. We had children staying in our home, questioning our fitness as a parent. That’s pretty standard once you’ve been committed involuntarily. We had to switch to a three-person system. So because my husband went back to work we always had a third person in our home. In our case it was my mother or my brother who was here, and I slept. And then I went back to work. I went back to work working for a female founder organization that funded female startups. I was working out of a co-working space. And I didn’t really share the experience. I thought, “This is my workplace and my home life and they’re separate.” And then I eventually found HiMama, which was amazing, after a few months of going back to work with Fiona. And HiMama, it was perfect for me at the time. We were a small company then just four or five people. It was [a] pretty new and fast-growing startup and so exciting. And it was the perfect opportunity for me personally to connect to this idea of supporting early-childhood educators and supporting high quality learning with my role as a new mother. And I thought, “Things are really good now. Things are better.” And then of course, as you’ll remember, when I was four months pregnant with my second child – who showed up unexpectedly – my father died by suicide. And as you know – as my great colleague and boss at the time – that was really rough for me. And even still then I didn’t really share about this experience that had happened at the hospital. I didn’t communicate with my caregivers and my daughter’s preschool about what had happened. We just sort of said, “My dad died.” We didn’t really explain about a previous history of mental illness with myself. And I just found, like, all throughout that whole experience I wasn’t really being very honest about this really hard time that we were having as a family and trying to find our way while navigating two pretty intense, growing careers between my husband and I – he also works in tech. So I wrote a book about it. I started to write it on my second mat leave with my son around this idea that our identities as parents and as workers are intertwined deeply. And in the end it worked out okay for me. I now launch the Workaround. I have my own company that supports working parents onsite with high-quality early education. The high-quality early education absolutely comes from my experience for years with HiMama and learning about why it’s important to have a strong foundation in the early years. And things are okay. My kids are healthy, I’m healthy, and we’re sort of coming in on the other side of it. So this is a really personal story that you’ve shared through Day Nine and on the Podcast here today. So I can imagine there was a journey certainly that you went through to finally get to the point where you committed to yourself that you were going to put pen to paper and write about this experience. What ultimately for you is the goal? What did you have in mind for when you started [to] set out on this journey to write this book, in terms of what you were hoping to get out of it, personally or otherwise? There’s two pieces of it: Personally, I felt like in a lot of cases I was lying to people, right? You know, I felt like even in the work with HiMama that we were doing with early-childhood educators I started personally to get really upset about childcare and about how hard it is for families to navigate the cost and struggles of childcare without sort of adding this lens that childcare is critical for me and my family because I need some separations from the grind of parenthood, from the sleeplessness, from the relentlessness that is parenthood when you have small children who don’t sleep. And I felt like maybe I wasn’t being totally honest about where I was coming at from this childcare site. And so that was part of the reason why I thought, “If I write it down then there’s this story that’s over here.” And if people want to opt to pick it up and hear my story, they have it. But I don’t have to feel like I’m carrying the weight of such a significant life event that happened without sharing it and explaining that that’s part of how I came to be. The other piece of it is more external, and that’s that when I went looking for resources on how parents are navigating severe mental illness and trauma – especially with postpartum depression – I couldn’t find it. There’s lots of Baby Center Forum-type parent articles. A lot of them are driven in a ton of shame. There’s a lot of pro-breastfeeding versus formula discussions online and bottled versus not. But I thought, “Where’s the writing that really dives deeply into the experience of parenthood and transitioning into childcare and what it’s like for a family after they have the baby?” And I thought, “If it doesn’t exist then I’ll write it.” Because my experience is pretty severe and I bet there’s a lot of parents out there that have similar – probably less-severe challenges – that maybe it would make them feel better if they heard my story. Yeah, and so you’ve shared your story, which I think is very unique and takes a lot of courage. But I don’t know what the statistics are but I imagine there’s a lot more mothers dealing with challenges like postpartum depression than we might think because most folks don’t talk about it. Any sense about any statistics or numbers with that regard? Yeah, there’s a poster that hangs in the hospital where we go for regular check-ins that says, “Depression is the number one most common complication of childbirth,” which really causes, like… let’s pause on that for a minute. It’s the most common complication in childbirth, that women will experience depression after. We know that six out of ten women will experience some form of PPA, postpartum anxiety or postpartum depression, usually within the first two years of their child’s life. In some cases it’s sudden and severe, like mine, within nine days. In other cases it’s brought on months later, years later, where because of the stigma with mental illness – and especially with mental illness attached to parenthood – a lot of people don’t speak out. They don’t seek treatment, even though in a lot of cases it’s incredibly treatable, right? There’s anti-depressants, there’s medication, there’s mindfulness therapy, there’s lots of routes that don’t involve involuntary hospital stays that can support parents. And it’s incredibly, incredibly common. Yeah, I mean, that certainly highlights the importance of having an open conversation about this and being really prepared for it if six out of ten new mothers are facing this challenge. And it is really shocking really because as a new parent – especially with your first child – you’re thinking about all these things that you’re stressing out about, like getting the room ready, and what are you going to do when the child arrives, and how do you do breastfeeding, and all these things. Yet this is something that most new parents probably don’t even think about, yet it’s, like you, said the number one challenge. 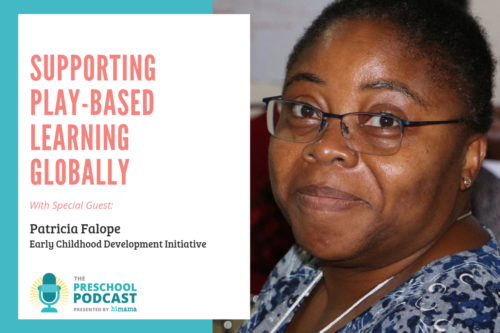 Now in the context of childcare, how do you think the preschool early-childhood education community can support their family community, knowing that this is such a common challenge that parents are dealing with? Yeah, this is where open communication with families is so, so important. I’ve talked to a lot of families, a lot of moms and dads who have experienced depression, because that’s one of the factors that can happen to a partner as well. 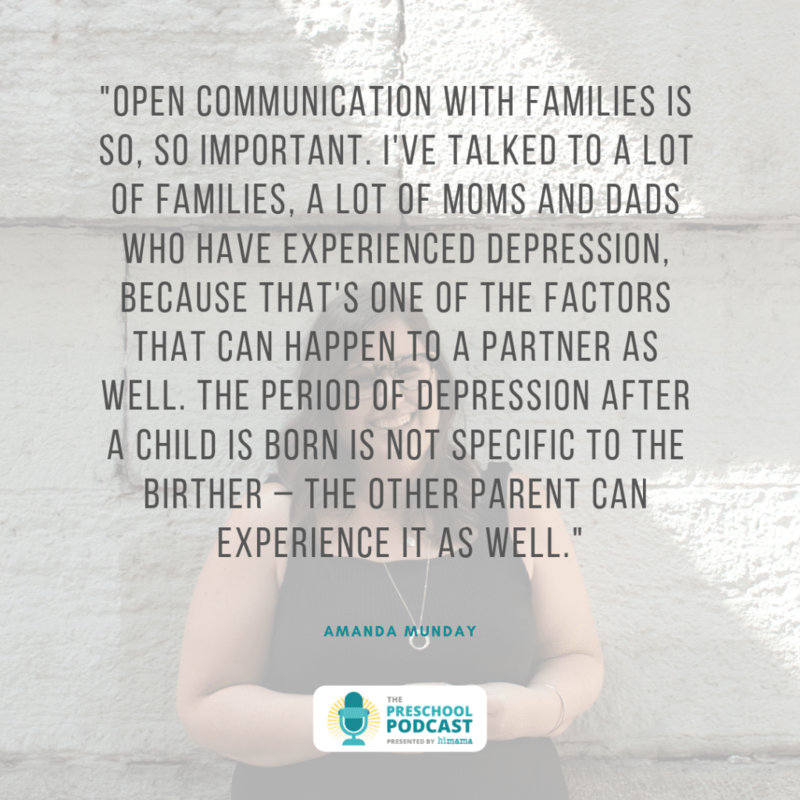 The period of depression after a child is born is not specific to the birther – the other parent can experience it as well. So it’s where I think regular, ongoing communication with parents as childcare providers and as parents recognizing that you need to share what’s going on at home with these childcare providers and that it’s not immediately going to result in Children’s Services being called. We know that our childcare providers, our caregivers want to help. They want to be informed about what’s going on at home so that we can say, “Alright, this helps us to understand what’s going on in that child’s life. How’s potty training going, for instance?” If that’s an incredible stressor on the family it’s important to know if that family’s dealing with something else at the same time that make something like potty training really difficult. 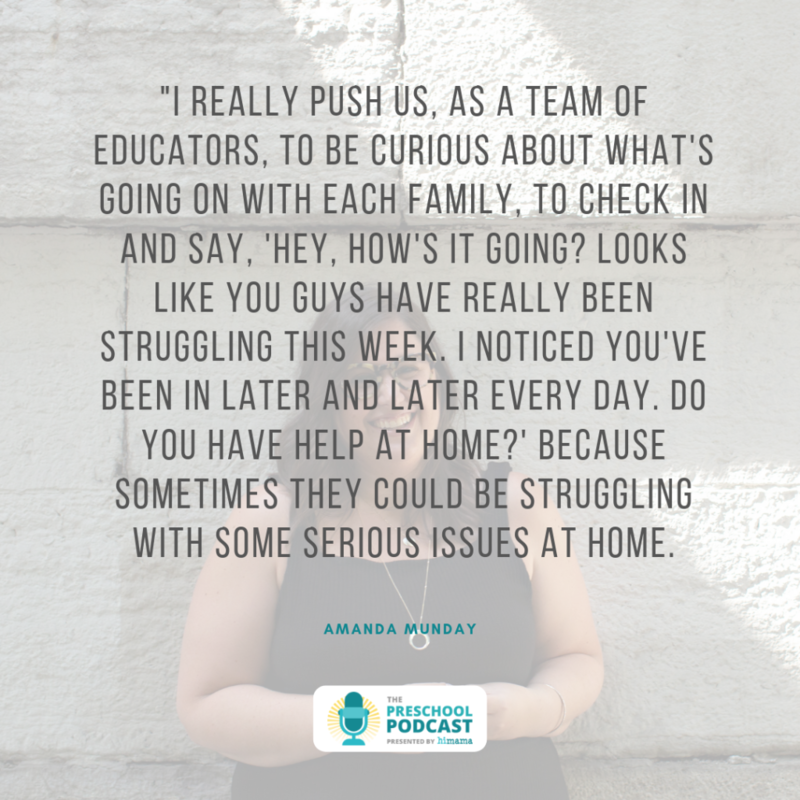 And I really push us, as a team of educators, to be curious about what’s going on with that family, to check in when you can, whether it’s by email, through HiMama, through even a side conversation separate from drop-in and pick-up and say, “Hey, how’s it going? Looks like you guys have really been struggling this week. I noticed you’ve been in later and later every day. How’s it going? Do you have help at home?” Because sometimes that family really is struggling, and we assume, like, “They’re just kind of all over a place like family.” But really they could be struggling with some serious issues at home. Yeah, and I think a key part of what you’re saying and what really resonates through is the power of authentic relationships between educators and parents, as opposed to something more transactional. You describe the pick-up-drop-off and you’re kind of smiling and saying Hi and Bye. But I think it’s important sometimes to have those conversations. And you can only do that if you feel like you have a trusting relationship on both sides. And you’re right, it’s really about an authentic relationship and about true honesty and not being not being fearful that judgment is coming. Because in so many cases, I say this, like, “Guess what? A lot of early-childhood educators are also parents.” So if we know that early-childhood educators and directors are parents, that means probably some of them have also experienced some level of postpartum depression or postpartum anxiety. And so if you share openly that you having some of these thoughts with a second child or if you’re pregnant with a second or third child, sharing openly that you have these fears and that maybe that educator has some resources they can connect you to, maybe they’ve got a great parent group that would be really useful to you to seek. But you’ll never know that if you don’t share it. Yeah, absolutely. We’ve quickly run out of time, but I do want to make sure our listeners know a little bit about your book and when it’s coming out and where they can access it if they’re interested in learning more about your personal story, which you’ve so kindly shared with us here today at a really high level. Yeah, absolutely. So Day Nine: A Postpartum Depression Memoir is available wherever books are sold online. In Canada it comes out on Saturday, March 30th . And in the U.S. it’s out on April 23rd . And I would love it if you would support the book. Wonderful. Amanda, thank you so much for sharing your story, both through Day Nine and also here today on the Preschool Podcast. So great to connect with you again, and thanks for joining us on the show.